The infant formula is a nutritious follow-on formula suitable for infants from 6 months onwards. 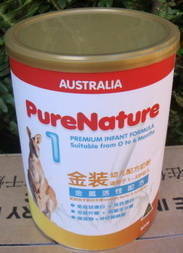 Follow-on formulas have increased key nutrients tailored to meet the needs of growing babies. * Omega 3: from 100% vegetable sources to help support brain and eye development. * Nucleotides: to help support immunity and a healthy digestive system. * Natural Carotenes and Selenium: antioxidants to help protect the body's cells. * Iron: essential for oxygen transport around the body.